When I can’t stand to open a paper or look at the news online (this week would be one of those weeks), retreating to the safe space of birds and nature is always a good idea. A revisiting of the daily haiku’s I used to do. 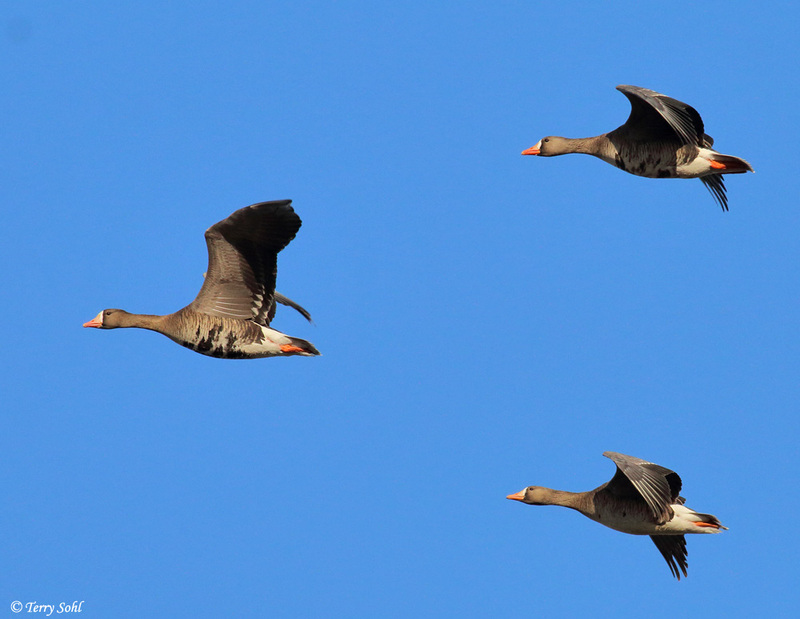 Migration has actually been a slow and delayed by the harsh winter, but streams of geese were flying over one morning last week. Always one of the first signs of spring, and a VERY welcome sight after this past winter. 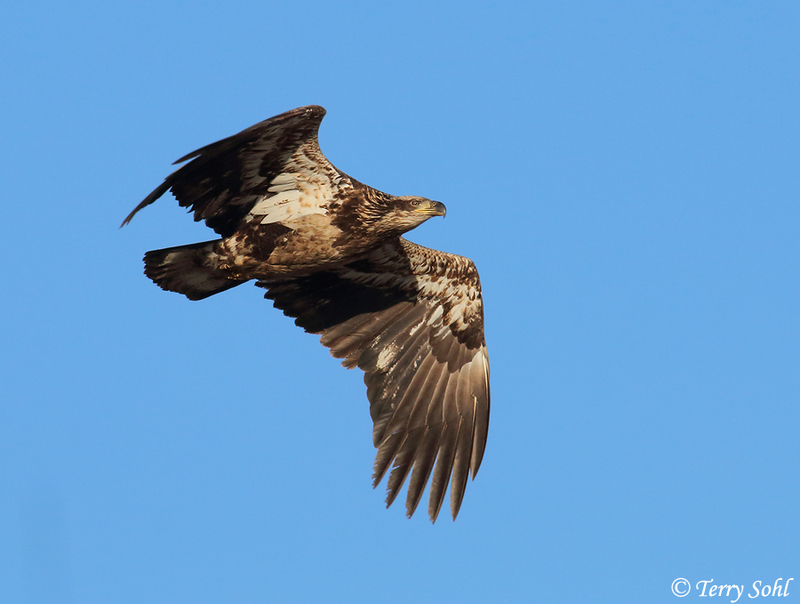 We’re approaching mid-September, and with it, one of my favorite birding migrations of the year. Warblers? Fall shorebirds? Migrating raptors? No, I treasure early to mid-Autumn for the wonderful array of sparrow species that migrate through eastern South Dakota. 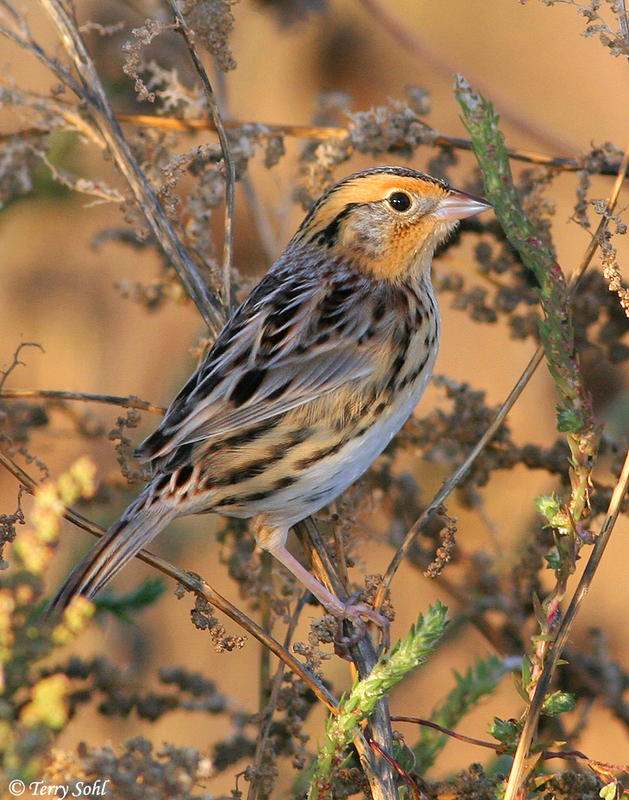 Among them are one of my top 3 species of all time…the Le Conte’s Sparrow. No “little brown job”…not “just a sparrow”…the Le Conte’s Sparrow is a brilliant array of complex patterns and beautiful warm tones. With a reputation as a “skulker”, they’re a prized birding target for many, but during fall migration here, I’ve found them to be very approachable and rather easy to photograph. Along with the other 20 or so sparrow species that migrate through in the fall, a sparrow bonanza is just around the corner! Birding > Bird photos? Or vice versa? 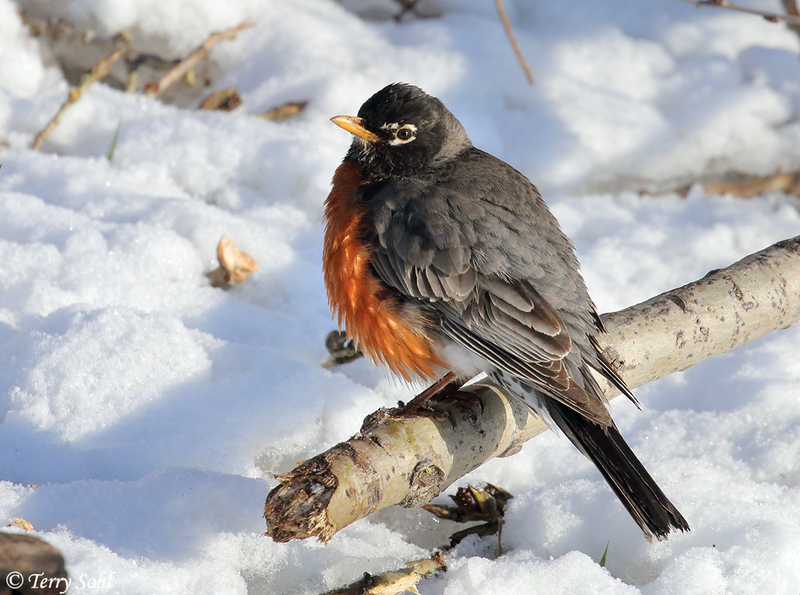 My start in both birding and photograph began in December of 2000. I bought my first SLR camera, and was excited to go out and use it. I headed out on a cold, snowy day, looking for…something…to photograph, when I came across some Canada Geese around the small unfrozen edge of a local quarry. 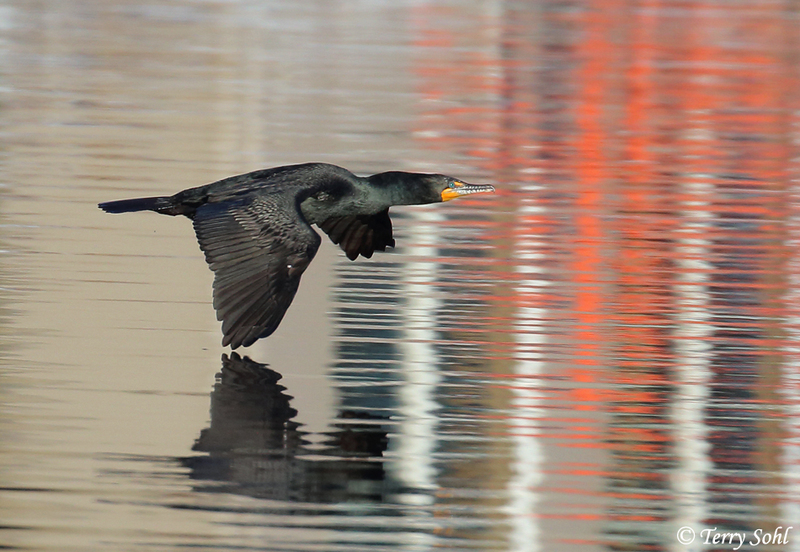 From the start, birds were my most common photographic subject. Soon, they were nearly my ONLY photographic subject. 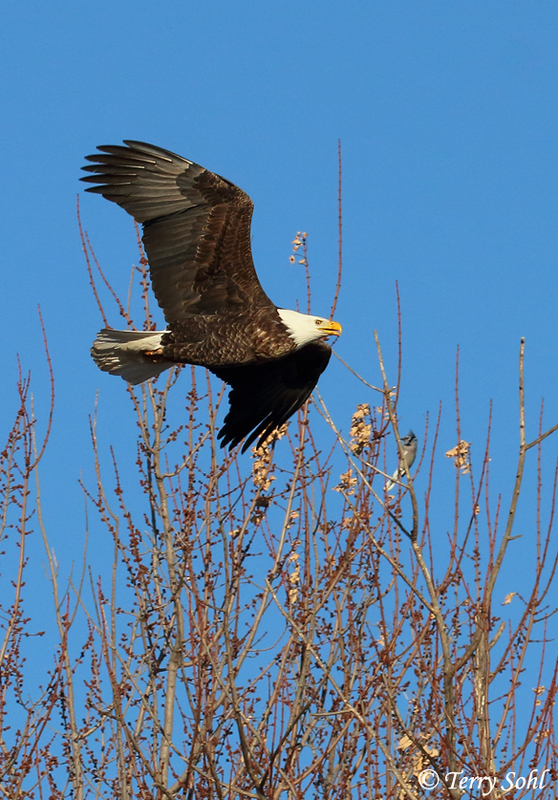 While I loved shooting birds, for many years, my primary focus when going out was getting photos. Seeing birds was certainly wonderful as well, but I tended to measure success of a trip in terms of how many “keeper” photos I got. Even if I saw a rare bird, I was often disappointed when I was unable to get a photo of it. Fast forward 18 years. I have photos for most species you could reasonably expect to see in South Dakota. 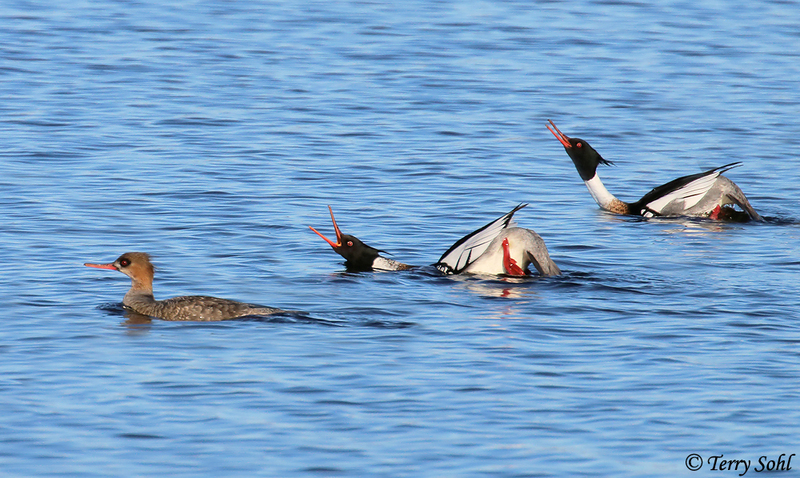 I have photos for many species you would NOT normally expect in South Dakota. I’m not sure if it’s because I’ve reached my saturation point for photos for many species, but in the last 3 or 4 years, things have changed. 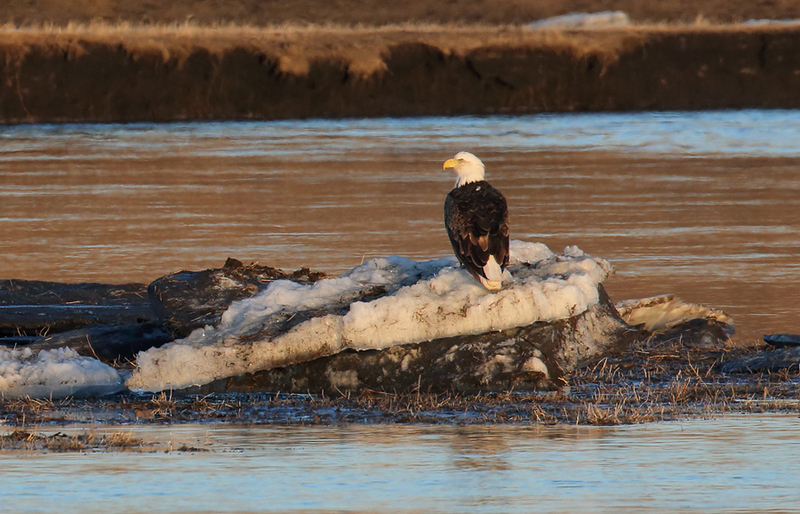 I was a photographer first, birder second. Now, I’m definitely a birder first, photographer second. I spend MUCH more time using my binoculars, scanning that far away bird to see if it’s a rarity. In the past, I often ignored far away birds, as I knew I couldn’t get a good photo. I think that’s what’s so nice about valuing BOTH the birds themselves, and the photography aspect. When you go out on a trip, you’re rarely disappointed. 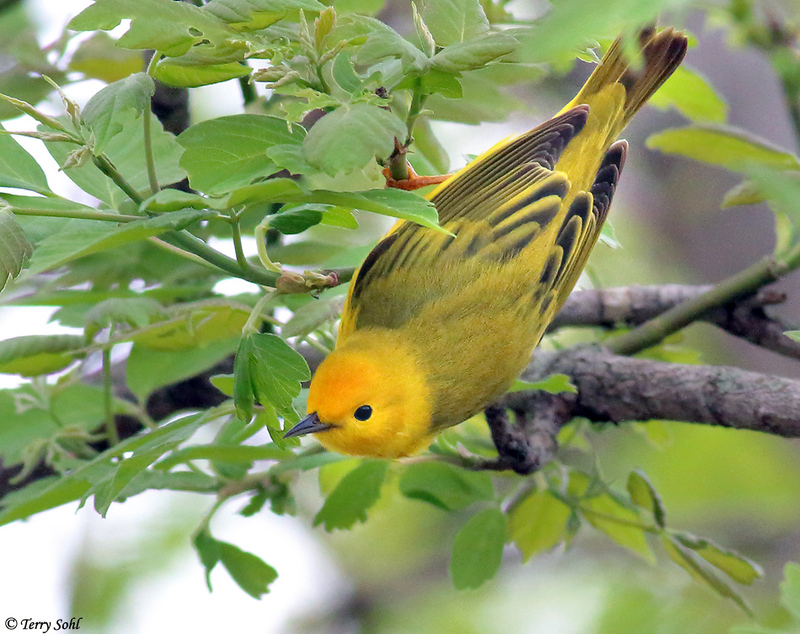 A curious Yellow Warbler. 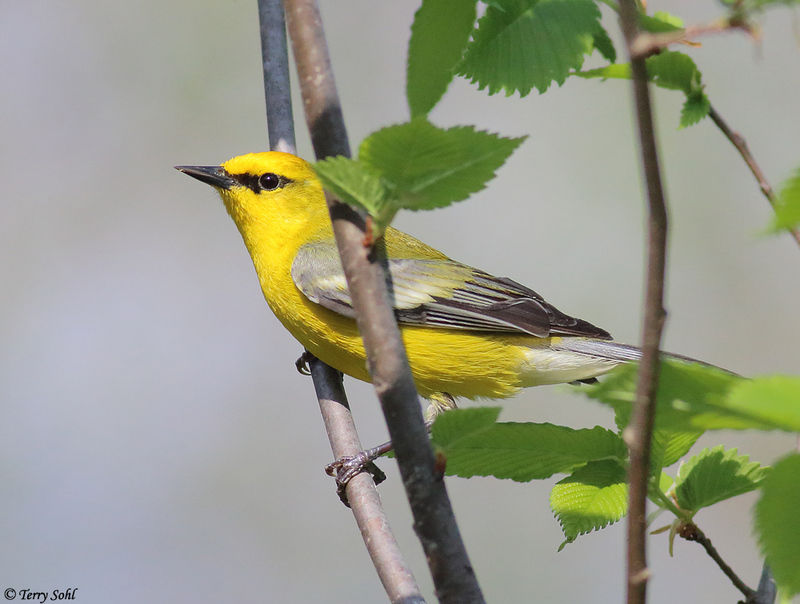 It’s been a very slow spring so far for migrating warblers, but as always, there’s never a shortage of Yellow Warblers around. 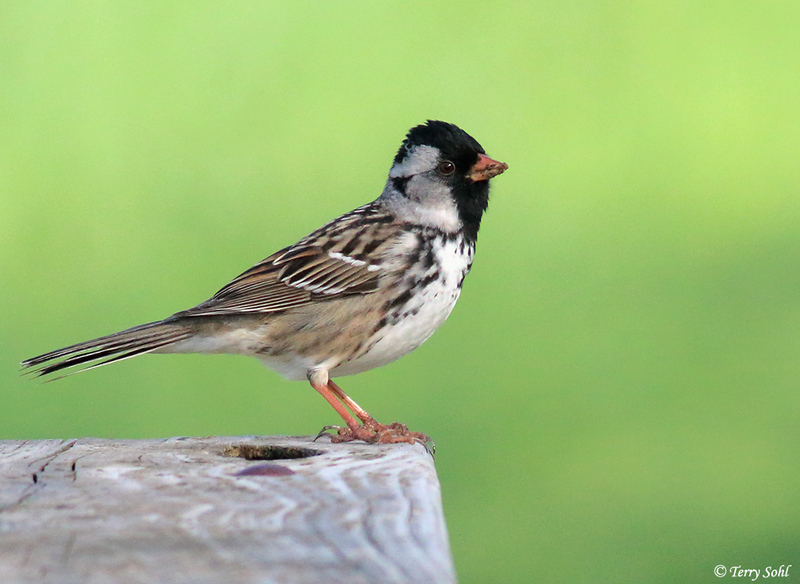 One of my favorite species, a Harris’s Sparrow. 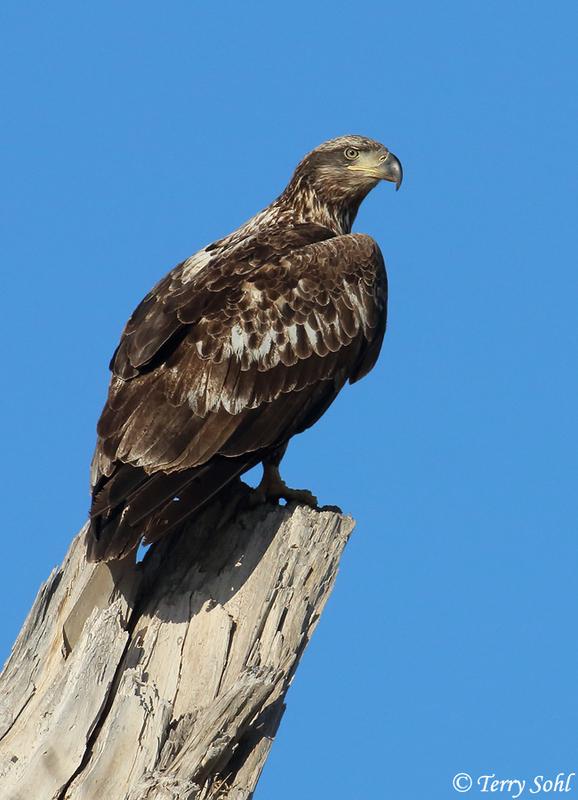 They are actually relatively easy to find here during migration. A Blue-winged Warbler, a rarity in South Dakota. 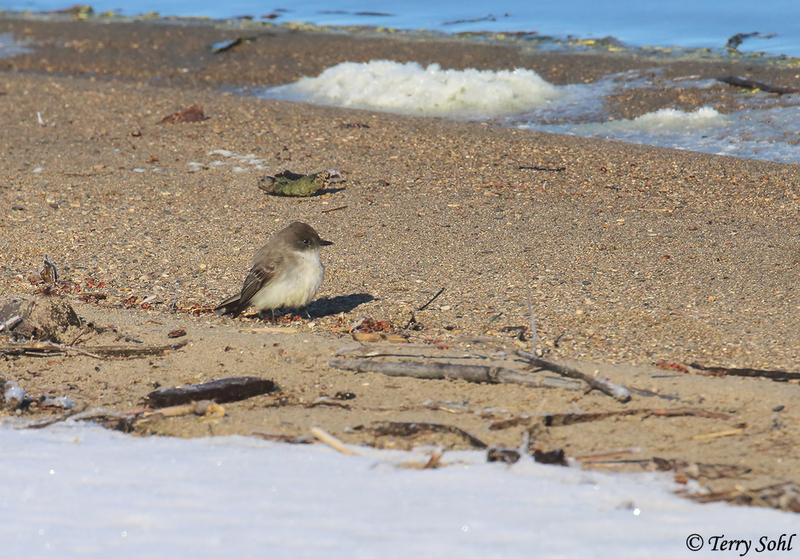 However, there’s one specific spot of Newton Hills State Park where one or two breeding pairs are almost always found. 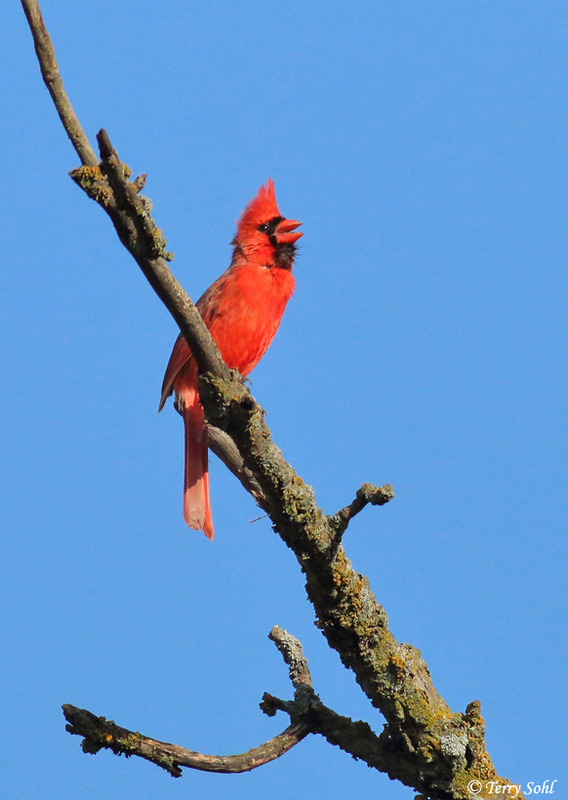 I have a billion Northern Cardinal Photos. However, when you get an opportunity for these guys, even if it’s a relatively long-distance opportunity such as this one, you can’t pass it up! I’m starting to really appreciate shots like this, or other shots where the bird is smaller in the frame. That’s particularly the case if I’m able to show a lot of their natural habitat in the frame. Here, I just like the simple composition, the pose of the bird, the warm light, and that beautiful blue sky. 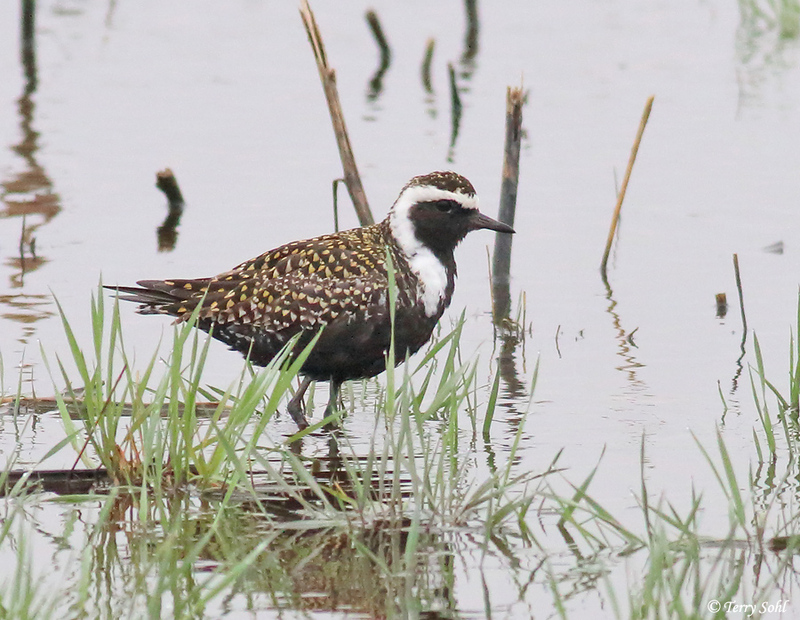 American Golden Plover! 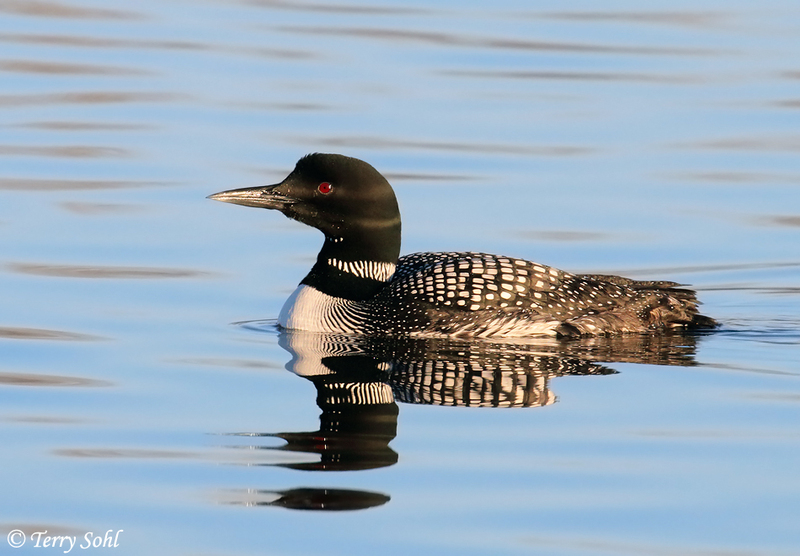 (Photographic) Lifer! A new lifer! Oh, I’ve seen American Golden Plovers. There have been a number of springs where I’ve looked out in a muddy field or the edge of a wet area, and have seen them. However, they’d definitely fall under the category of “photographic nemesis” bird, in that I’ve never gotten anything close to a “satisfying” photo. Yesterday wasn’t exactly a day where I’d have expected any halfway decent photos. It was rainy, gloomy, and a bit windy…not exactly great birding weather, much less photo weather. 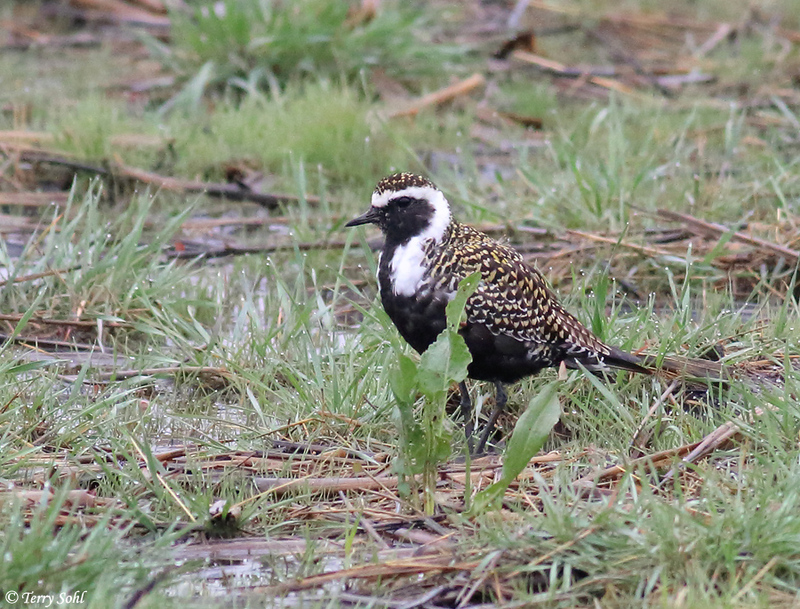 The rain changed my plans though, and it’s because of that I ran into a small flock of American Golden Plovers foraging in a flooded field. Perhaps it was BECAUSE of the somber, gloomy day, but they let me get uncharacteristically close. With the lighting these photos aren’t exactly going to win any prizes, but when you’ve been shooting birds for almost 20 years, ANY time you get a new “photographic lifer”, it’s a good day! After such a cold, snowy spring, we’re finally starting to warm up. It was a nice sunny day of about 60 degrees, and even better, our ever-present wind wasn’t bad, so I headed out before dawn to look for migrants. 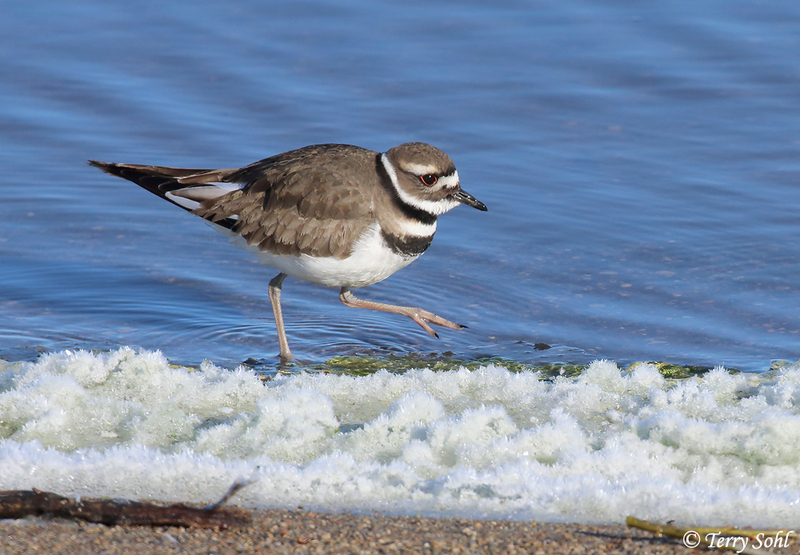 My target for the day…shorebirds. If the day were to be measured on the basis of that target, I failed miserably! It’s APRIL 28th!! With such a wet, snowy spring, we have standing water all over the place! 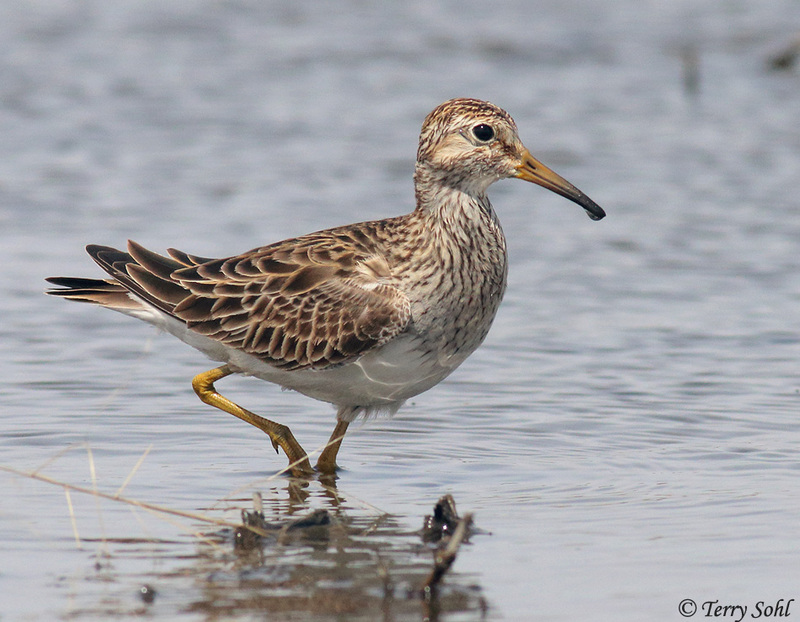 Shallow water, mudflats, flooded fields…there’s as much great habitat for migratory shorebirds as we ever have in the spring. 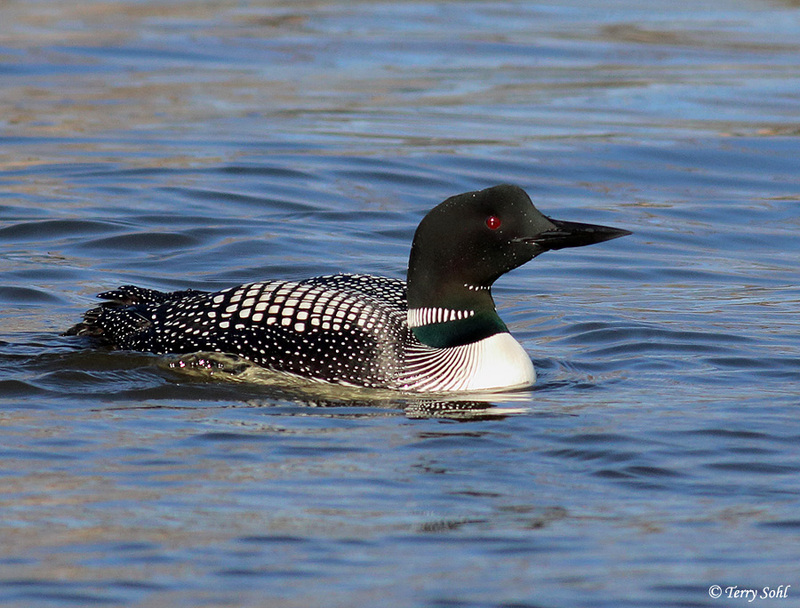 A Common Loon at Wall Lake, west of Sioux Falls. There were (at least) three on the lake, and thankfully one was fishing right off a point extending out into the lake, giving me great photo opportunities. A Sora on the edge of a wetland, taken just as the sun was rising. 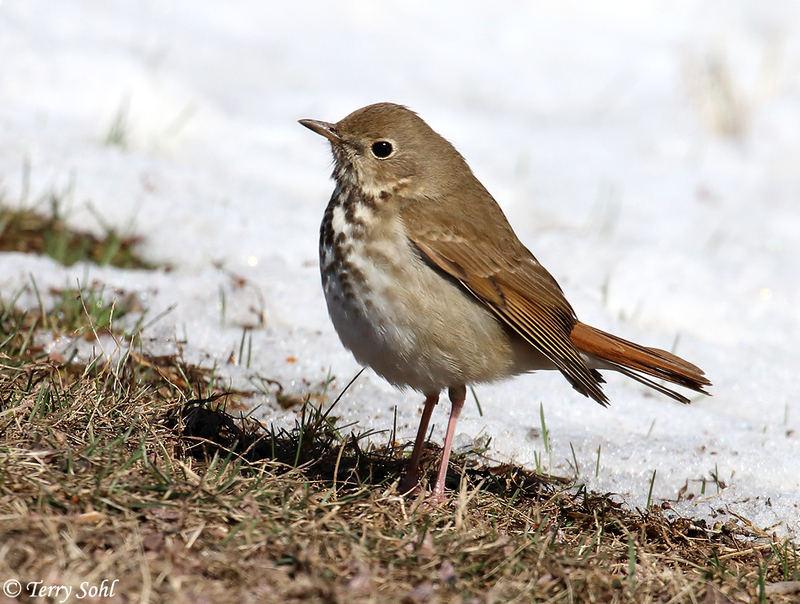 Always good to get such a shy bird out in the open like this. 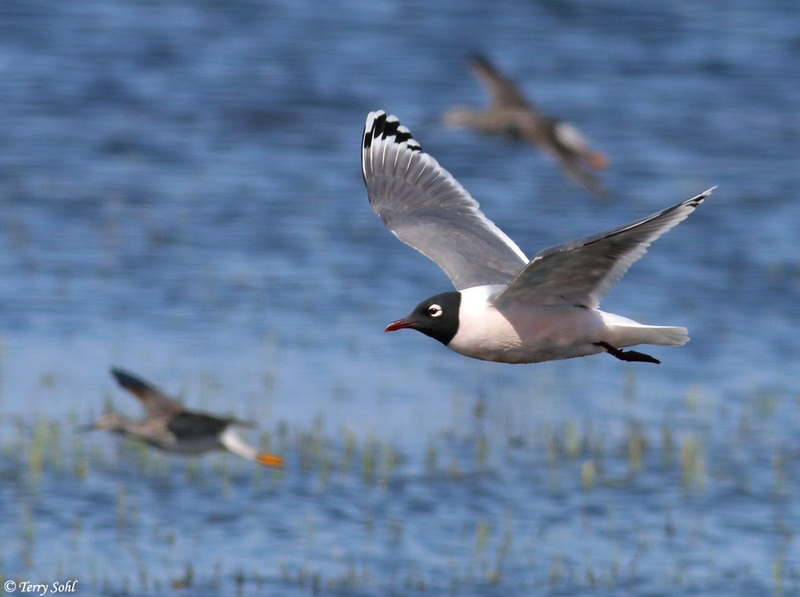 A breeding plumage Franklin’s Gull, with a pair of Lesser Yellowlegs in the background. One of my favorite birds in the Spring, particularly when they have the pink blush on their undersides such as this. 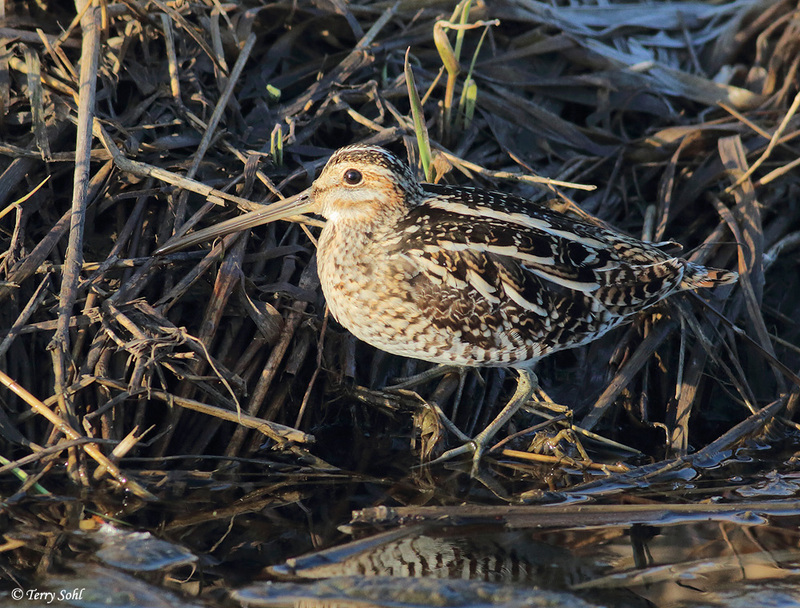 One thing I’ve learned to check in the spring are flooded ditches, as they seem to be favored haunts for Wilson’s Snipe. 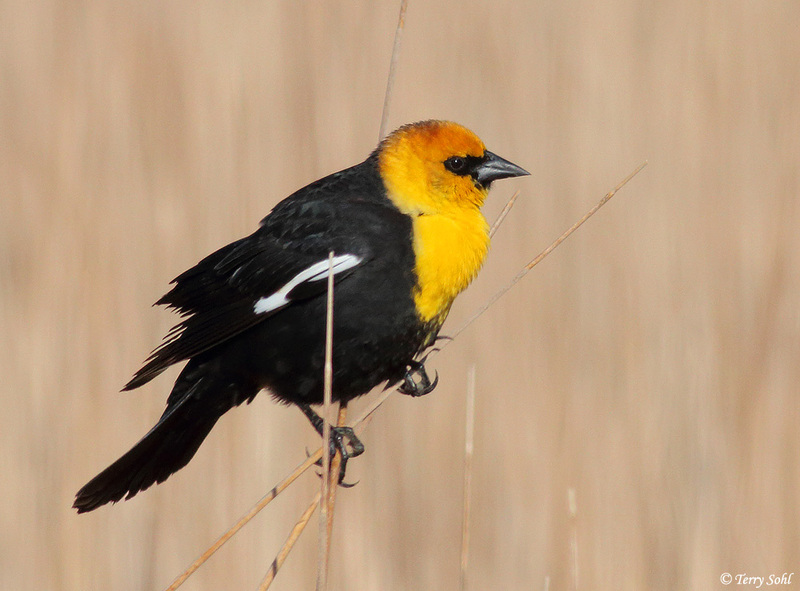 I have a billion Yellow-headed Blackbird photos, but how can I resist? 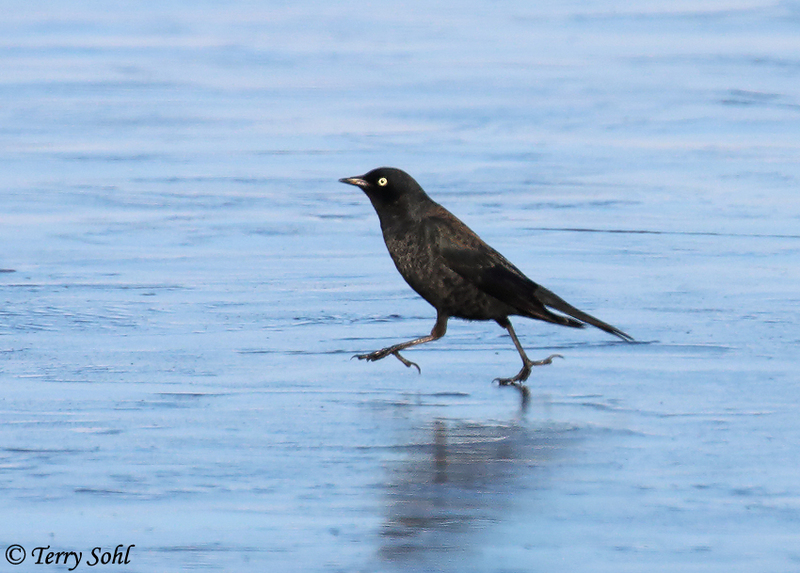 They’re such beautiful birds, and on a day like today when there just weren’t all that many birds around, the ever-present Yellow-headed Blackbirds make a great photo subject. It’s been a damned cold spring. There’s no denying that. As I speak, it’s snowing to beat the band…on April 8th…and we’re supposed to end up with about 5 more inches. It’s been a winter of MANY 3-6 inch snows, and winter doesn’t seem to want to give up its grip just yet. But the birds are putting their two cents in and saying they will NOT be deterred. I went out west of Sioux Falls last night, on a kind of a day that’s been rare around here lately…sunny, and no wind (but still pretty cold). Even now, most of the big lakes are still frozen over, as are many of the small ones. Water is starting to open up, and the waterfowl are really starting to stack up as they await warmer conditions (and more open water up north) to allow their continued migration. There are still geese around by thousands. I had a blast at one location last night, watching as flocks of Snow, Greater White-fronted, Canada, and some Ross’s Geese would intermittently land or take off from a group of geese resting by a large slough. Ducks were on pretty much every available patch of open water, with some spots having incredible concentrations of Lesser Scaup and Ring-necked Ducks, as well as pretty much every other duck species you could ever expect to find here. A highlight came late in the evening when I came across a Great Horned Owl perched in the relative open (for a Great Horned Owl). He was quite unconcerned by the guy with the camera, giving me some of the best looks and photos I’ve had of the species. As the snow and wind lash us again today, it was also a nice reminder that spring IS here and better weather is ahead! 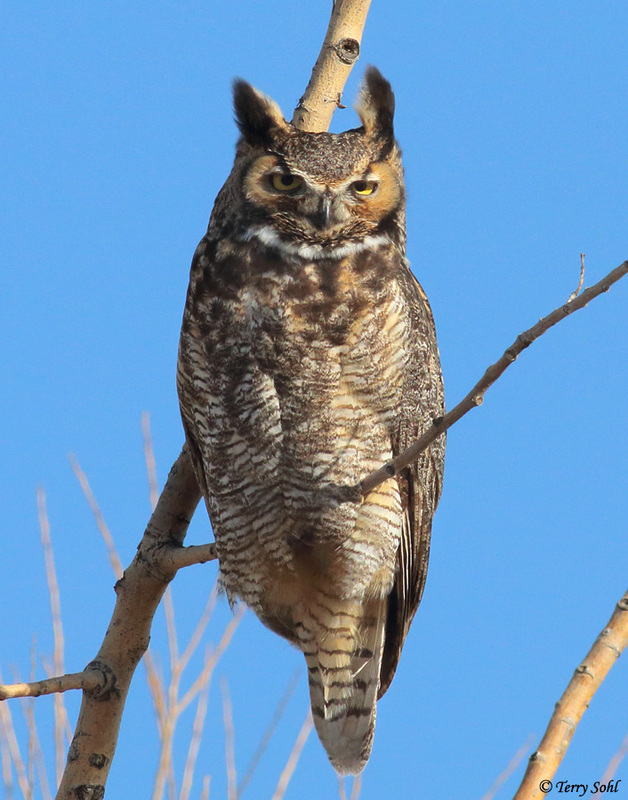 A quite tame Great Horned Owl, casually giving me a glance as he prepares in the late evening for a night of hunting. The most numerous goose species were Greater White-fronted, of which I came across several thousand during the course of the evening. 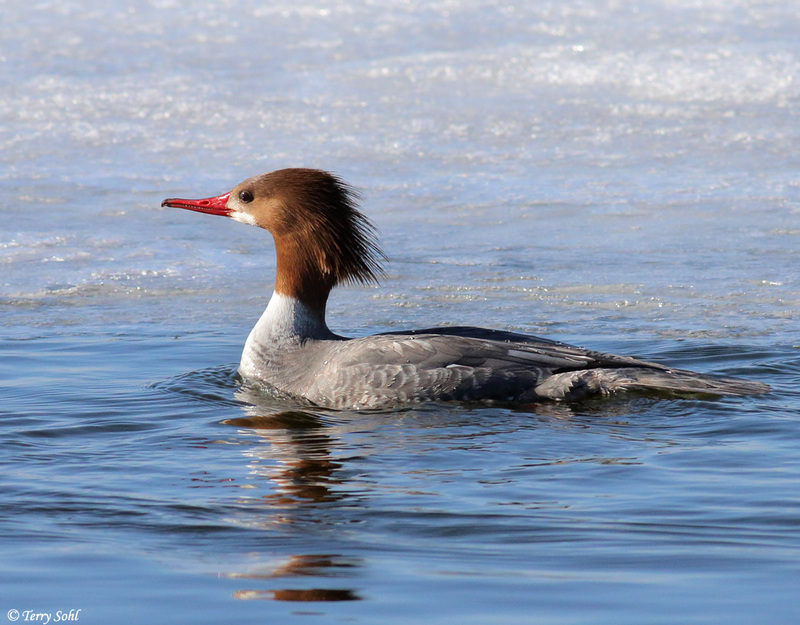 A female Common Merganser, sitting at one of the open spots in the ice and occasionally making a dive in search of food. Always loved the “haircut” on the females. 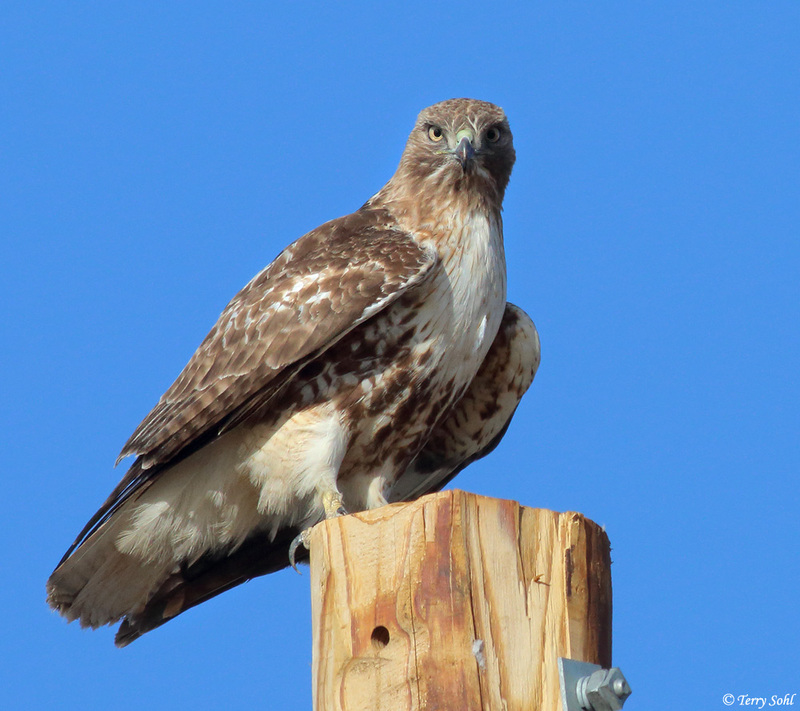 One sure sign of spring here is when you seemingly see Red-tailed Hawks and American Kestrels on every every telephone pole. Plenty of both last night, including this dude giving me a staredown. Another sure sign of spring…when the ever present Canada Geese are vastly outnumbered by other geese species. 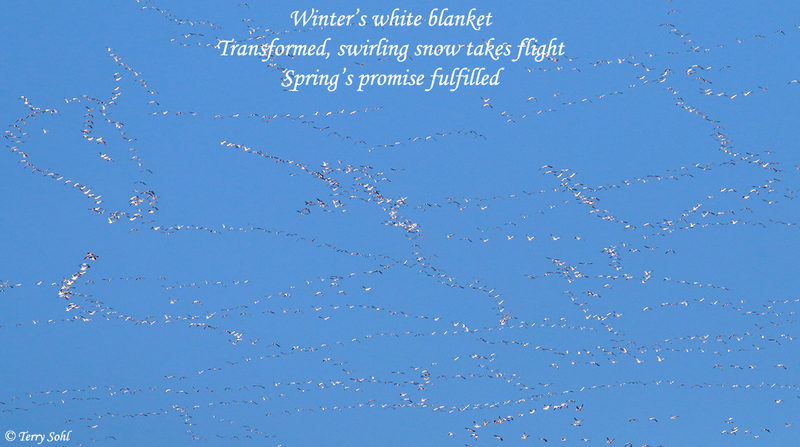 Still plenty of Snow Geese around. Starting to get a little late to have them stacked up in such huge numbers, but the weather hasn’t been too cooperative. 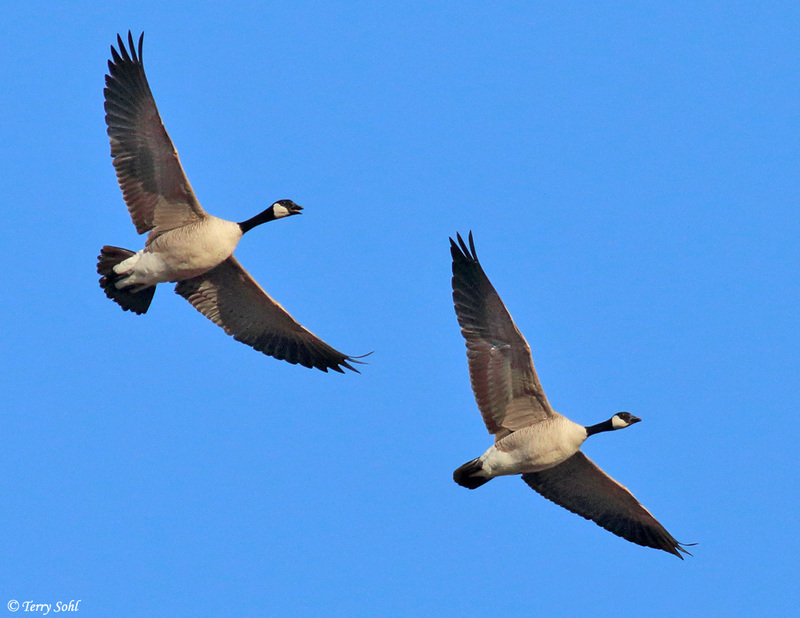 Birds are definitely on the move in the area, with thousands of geese and other waterfowl moving through the area in the last couple of weeks. I haven’t had a chance to get out much, but did manage to get out for a couple of hours south of Sioux Falls, in Lincoln County. With all the snow melt, there’s certainly plenty of standing water, even without the lakes and ponds themselves still frozen. There were a number of places I found Snow Geese, Greater White-fronted Geese, Canada Geese, and the usual duck suspects hanging around the standing water and surrounding ag fields. While watching one group of (mostly) Greater White-fronted Geese, I saw a strange-looking bird. The group flew just as I was starting to get binoculars on him, so I quickly grabbed the camera and tried to get a few shots. Not the greatest photo in the world, and it is from some distance, but it sure looks like the bird in the upper-right is a hybrid Snow and Greater White-fronted Goose. 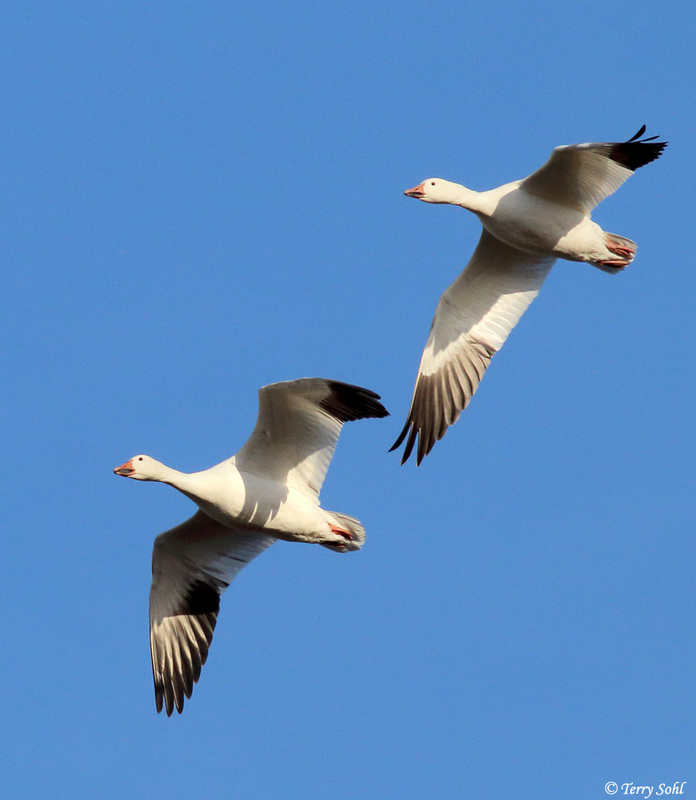 Much of the plumage and white base of the bill screams Greater White-fronted, but the extensive white, and even the “smile” patch on the bill are Snow Goose characteristics. Not a hybrid I’ve seen before, but I guess not too surprising given how much these two species intermingle, at least during migration through the state. 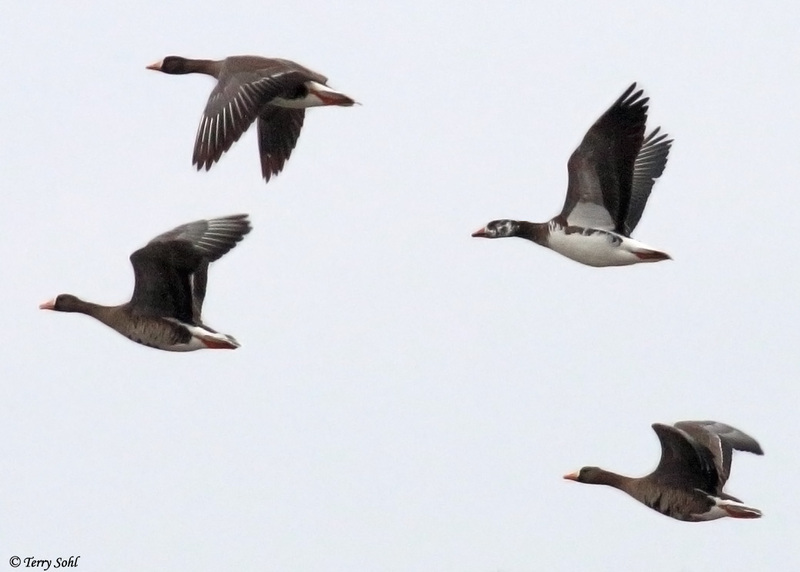 Bird in the upper-right, appears to be a hybrid of a Snow Goose and a Greater White-fronted Goose. What an utterly fantastic spring day of birding! It was one of those patented, windy South Dakota days, but the wind certainly didn’t keep the birds from showing off for the camera. I headed out this morning and spent a bit of time at Newton Hills State Park in Lincoln County, before deciding to spend most of my time looking for shorebirds. It was the right choice, as I ended up finding hundreds of shorebirds at Weisensee Slough in western Minnehaha County. It was the perfect set-up for my chair blind, a hunter’s blind I use as a photography blind. It’s got a little folding chair with short 8-inch legs, and then a camouflaged shell that pulls over the top. There are multiple zippered openings for views, and with the low profile, birds don’t seem spooked by it, once they forget about the guy who set it up and crawled inside. 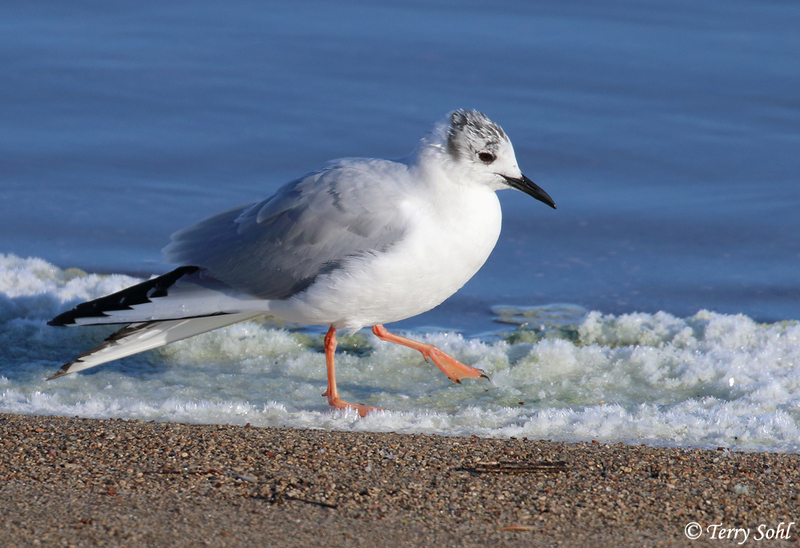 I ended up spending almost 3 hours in my chair blind as shorebirds of many species paraded in front of me. Some species would venture so close to the blind that my camera wouldn’t focus (my long lens has a 12-foot minimum focusing distance)! Others didn’t get quite as close, but I certainly couldn’t complain about a lack of photo opportunities. 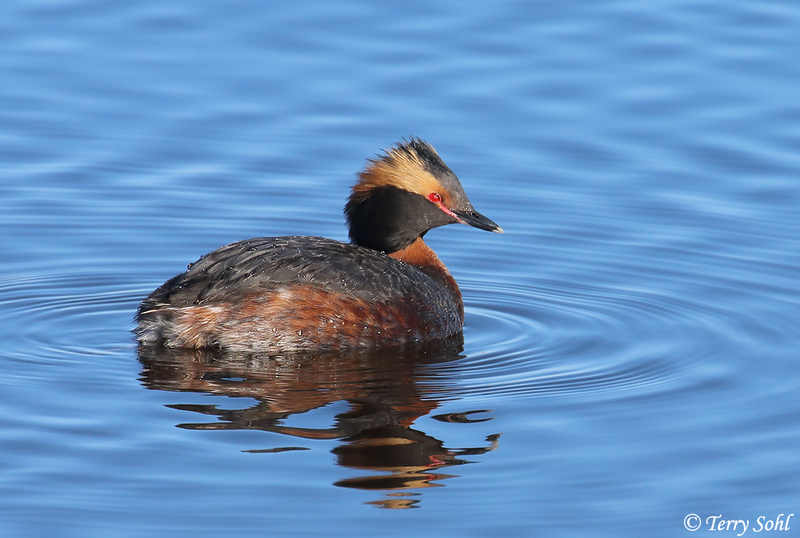 Fantastic birding day, and fantastic photo day! Some photos from the day…click on any for even larger views. 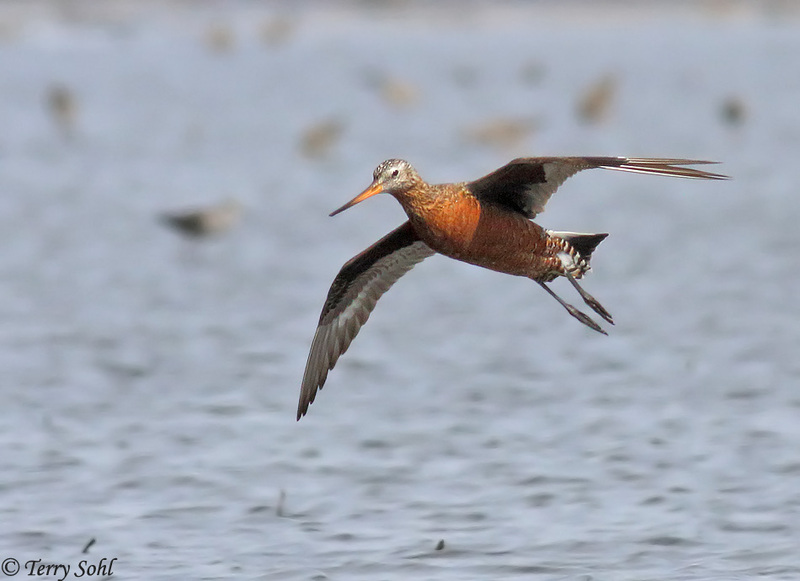 A male Hudsonian Godwit coming in for a landing. 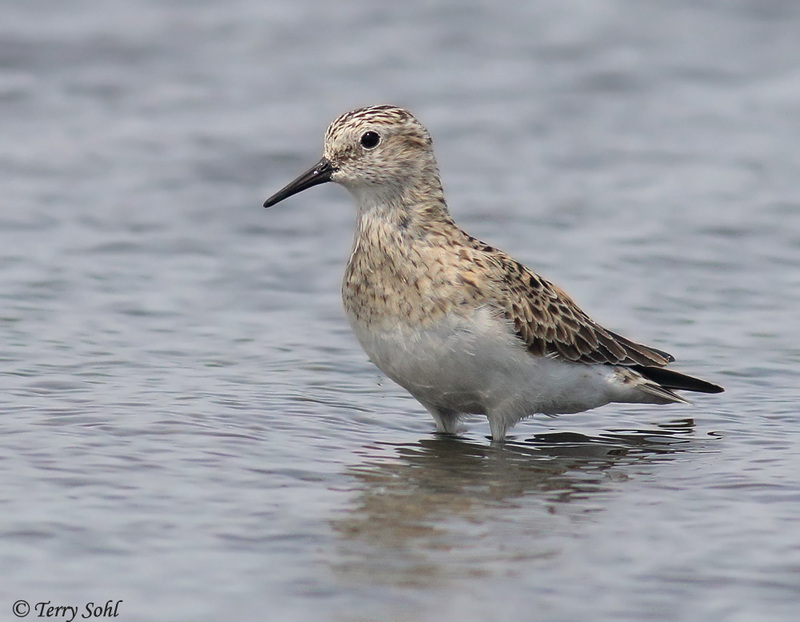 One of my favorite shorebirds, and one I don’t see all that often. However, today I saw at least 20 at Weisensee Slough, the most I’ve ever seen at one time. 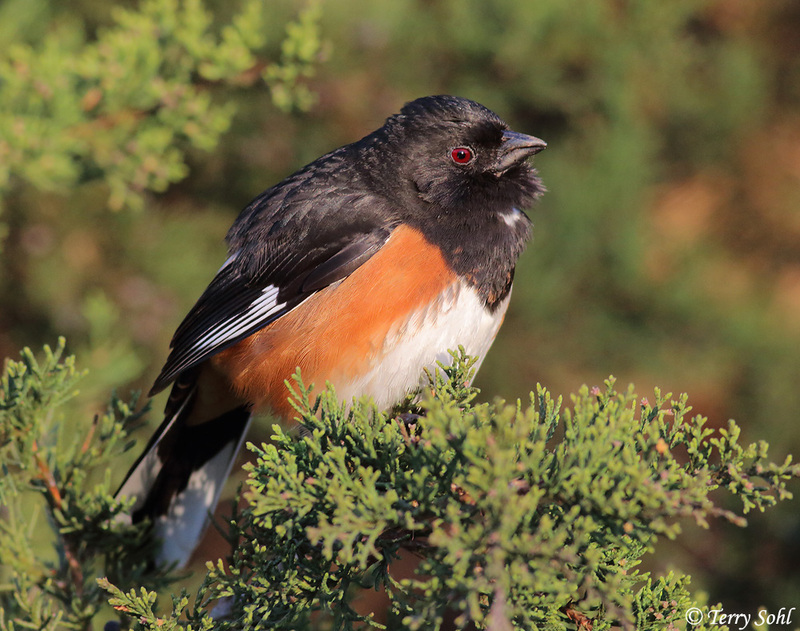 I didn’t spend much time at Newton Hills State Park, but while there I saw (and heard) many Eastern Towhees. Here a (chunky!) male hangs out in a cedar tree in the warm dawn light. 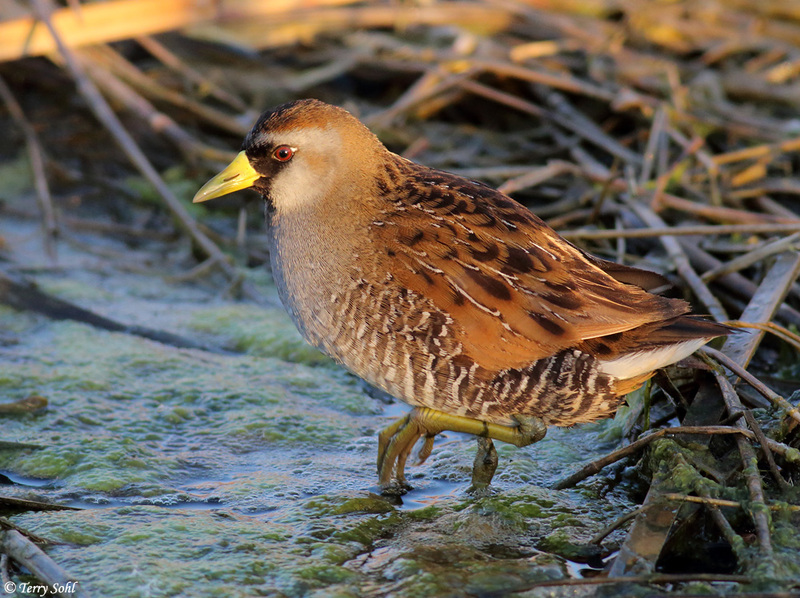 While driving past a cattail-filled wetland in Lincoln County, I heard the distinctive call of at least 2 Sora. 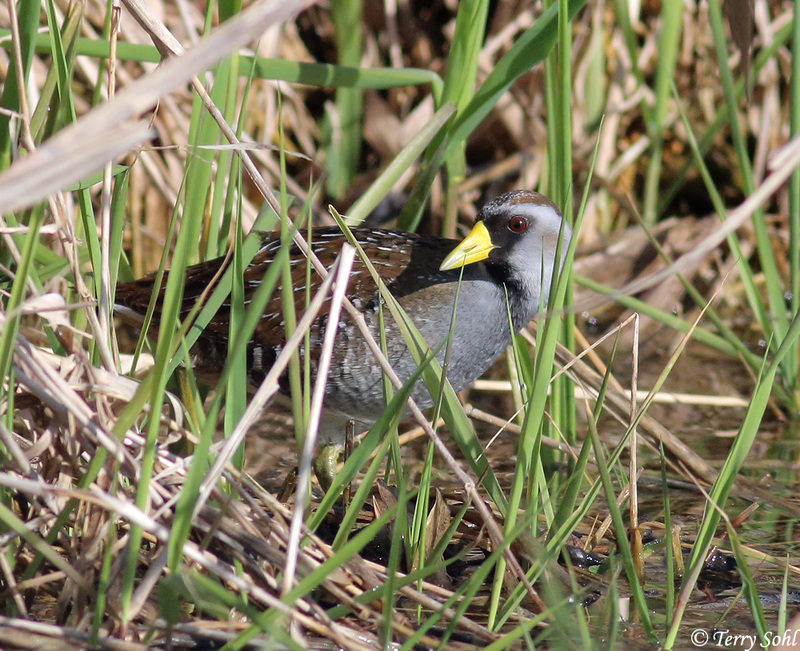 One eventually gave me a peek…ANY peek of a Sora is a welcome sight, given how secretive they are! A Pectoral Sandpiper strutting its stuff mere feet in front of my chair blind. This bird certainly had no idea I was sitting inside, as at times he was too close to the blind for my camera to focus! A Baird’s Sandpiper foraging in the shallow right in front of my blind. 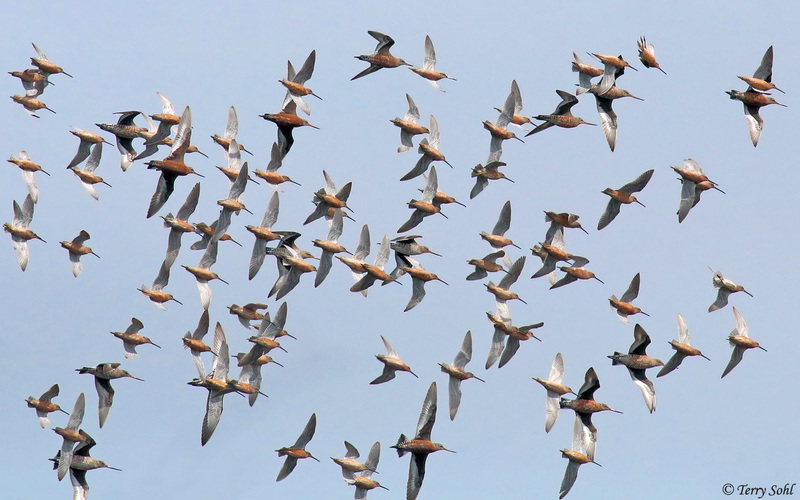 There were DOZENS of Long-billed Dowitchers and at least 20 Hudsonian Godwits foraging at Weisensee Slough. Every once in a while something would spook them and they’d take flight…usually RIGHT when they were starting to get within photo range of my blind! Sigh. But I did get some flight shot as they whirled around after a spooking event. 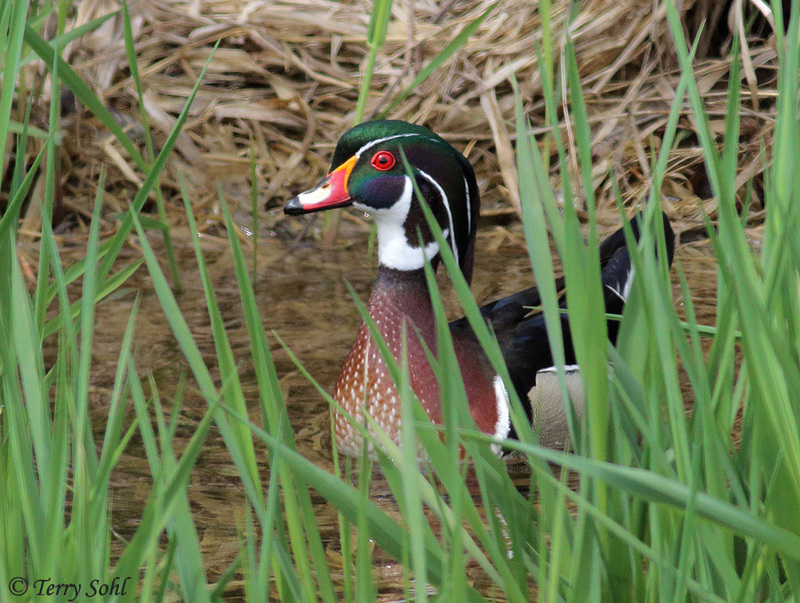 A male Wood Duck, trying to blend in and hide from the camera. 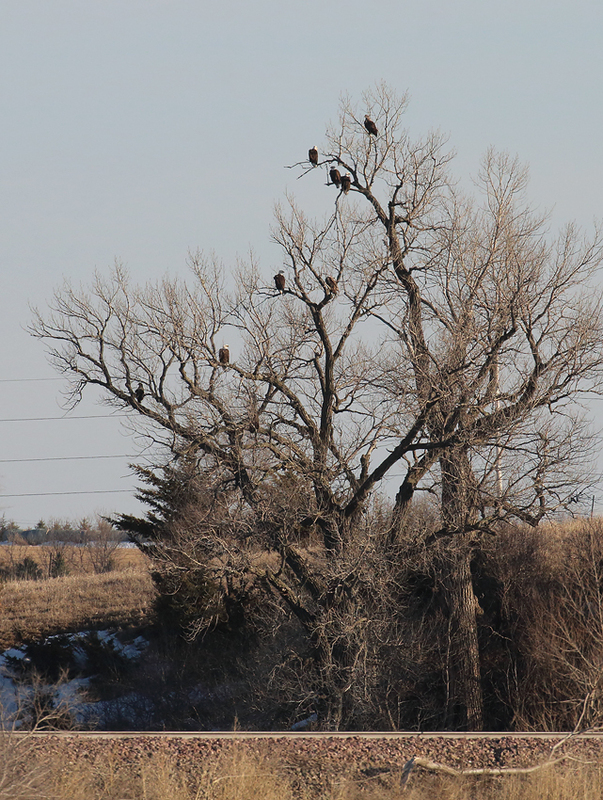 This was along “Ditch Road” just north of Sioux Falls. That was once one of my favorite birding locations. However, in the last year or two, they’ve cut all the trees along the ditch, and the birding is just a shadow of its former self. 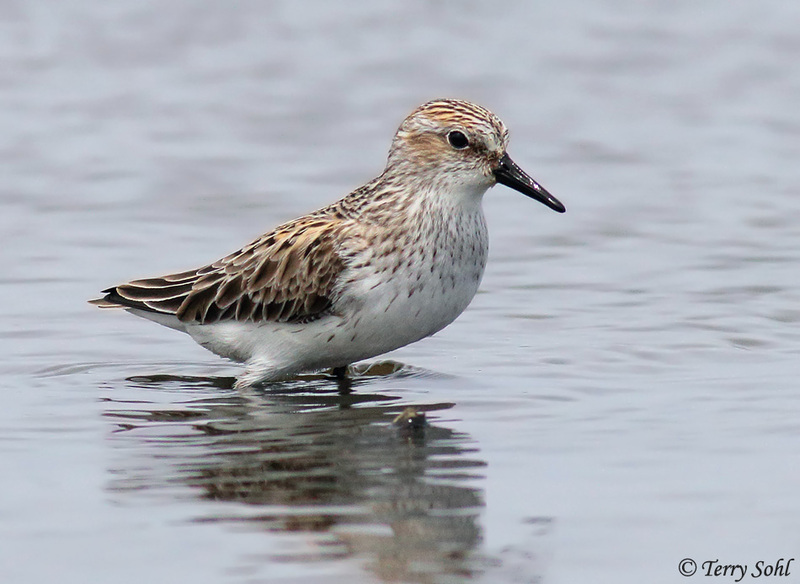 A Semipalmated Sandpiper. There were a few Least Sandpipers mixed in as well, but overall these guys were by far the most common “peep” on Weisensee Slough today. 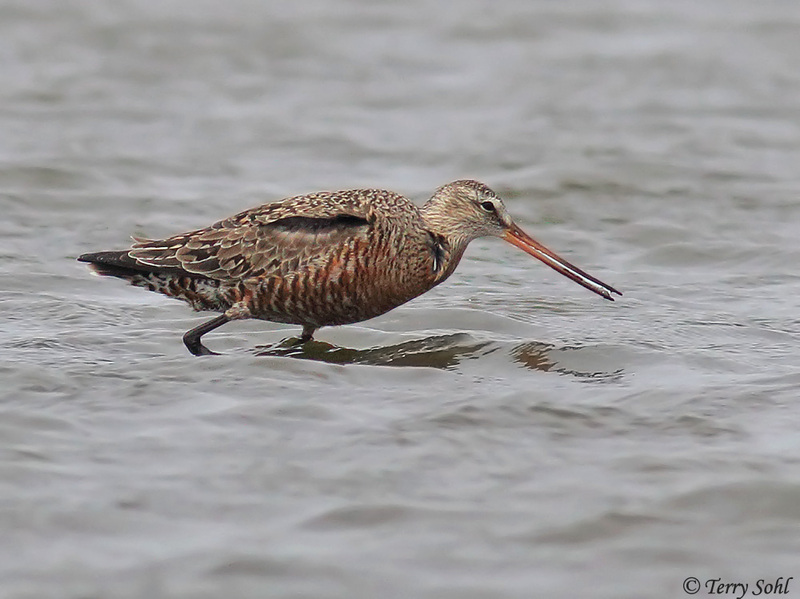 Another Hudsonian Godwit at Weisensee Slough. These guys were a bit shyer than the other shorebirds and didn’t approach my blind as closely, but I still got some very nice looks at them.